The world of fashion is one very dynamic industry that generates more than 3’000 Billion USD of sales every year. From ready-to-wear, to Couture, sportswear or even Childrenswear, it is a very juicy industry to work with. Here are the key facts and numbers you might want to know and that will define the incoming trends. From the 3 trillion USD, womenswear represent 621 Billion USD worldwide. Fashion is never out of fashion. A simple statement that means a lot. Today more than 5 million manufacturers maintain more than 2 million brands across the globe (source: Euromonitor). In the last 20 years, the fashion industry employed a lot of people. It went from 15 million employees back in the early 90’s to almost 30 million today. From this 3 trillion dollars business, 6 segments outstand from the rest. 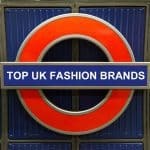 The leading category is Womenswear that reached 621 billion dollars of sales last year. It is followed by Menswear, Retail, childrenswear, sportswear and the very specific yet important bridalwear (see below chart). 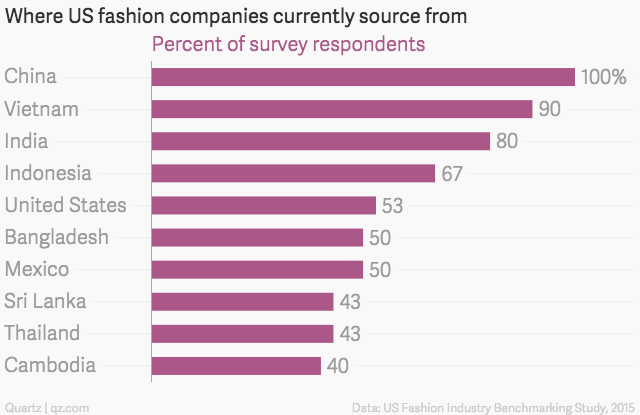 When we look into the womenswear business, we can see a lot is happening online. E-commerce has dramatically increased sales for women’s clothes and some markets like the US opened the door of a new gigantic distribution channel. Online sales became a very strong growth opportunity for several brands. 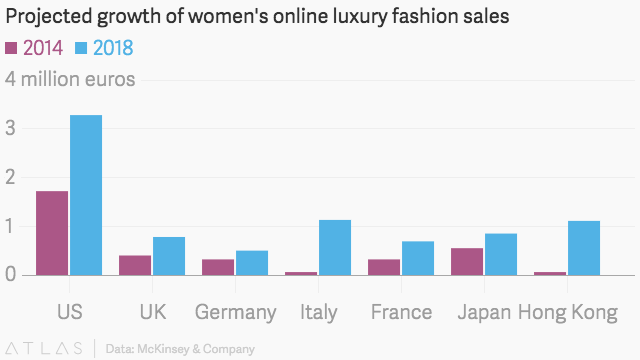 Countries like the US just doubled their womenswear online sales in merely 4 years. Other countries like Italy just started from nothing a million dollars online business. This very positive evolution is mainly explained by the development and the democratization of internet, social media and e-commerce. Today, it is very easy to sell online and start one’s own e-business. While luxury goods purchase in physical stores has been growing by 3% since 2013, online sales have a solid 20% growth reaching USD 9 billion. Luxury e-commerce became a strong luxury news among brands, not only because technology allows a better online user experience but more and more brands have embraced the e-business era. Currently online sales in the luxury industry represent only 7% of total luxury sales in the world but in the next 5 years it should grow aggressively and reach a total USD 22.5 billion. Already today, we know that more than half of all luxury purchases have a digital component in the purchase path. In deed, more than 50% of luxury buyers get information online before acquiring a luxury good or service. Thanks to this, the total womenswear sales outsold menswear globally and the difference is pretty big as it represents 50% more. While menswear has seen a certain stagnation from a value point of view, the womenswear continues to grow. Part of the answer is the slow pace in which the men’s suit industry is going. 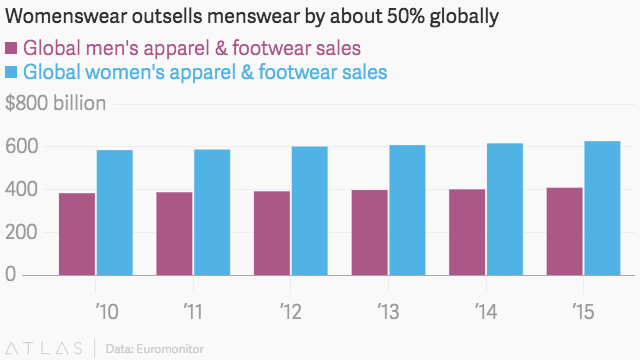 Men are investing less in suits, or at least they are buying cheaper ones. Technology and globalization allows any man to buy a convenient suit today for 40% less money than 15 years ago. So while volumes are pretty positive, the value stagnates. Same thing with the footwear industry. We know Fashion went from the small artisan in Paris or Milano to become a worldwide industry. While in the beginning of the 20th century certain materials would travel for several month in a boat before getting to a dress, today in hours you can produce and deliver a piece of clothe produced in the other side of the world. This is the power of globalization. The positive aspect of it is that you can source the best materials and the best know-how no matter where it is located. You can successfully produce cashmere in Mongolia, exotic leather in South-Africa, Cotton in Peru or even shark skin from Malaysia. It is all about connecting the talents through communication, technology and people. When the main fashion companies in the US are asked about their production facilities and where they currently source from, a high rate will say Asia with China on the top (see chart below). This means Asia became the world’s factory. There are still a few exceptions like Mexico and Bangladesh but quality is not always present in these countries manufacturers. Trends are evolving fast and because fashion never sleep, Fashion brands need to adapt their strategies to nowadays world. Some of them succeed in doing it, others… well, much less. What makes a Fashion brand desirable? It is a clever blend of excitement, innovation, originality and sacralization. This last word is a strong one but a good one to describe the desire millions of people can have for a brand. The construction of a Brand reputation is a complex process and when you get there you wish to maintain it. The sacralization idea comes from the fact that generally there is a brilliant and creative mind that gave the spirit of the fashion house. Fashion icons like Yves Saint Laurent, Christian Dior, Jean-Paul Gaultier, Thierry Mugler, Jeanne Lanvin or André Courrèges, were the foundation spirit of their respective fashion brands. People would come and buy their clothe because they would feel connected to the state of mind and for what they stand for. The beginning of the 20th century, the 50’s, 60’s, 70’s or even the 80’s saw the birth of amazing fashion names. People would dream about haute-couture and buy Pret-à-porter. Fashion was elevated as art and a strong self-expression for creativity. The 90’s were interesting for the creation of smaller brands, generally called “young or new creators”. André Malraux used to say that the past and the future, heritage and modernity are not antagonists. At the contrary, heritage and history can be strong sources of creativity and modernity. This is a state of mind and a strong philosophy that timeless brands know very well. When Marc Jacobs got inspired by Diane Vreeland, the fashion goddess of Harpers Bazaar and Vogue (30’s to the 60’s) for one of his collections, it was a strong reference to fashion heritage. Yet, modern and avant-garde. He invited Caroline Vreeland, her Great Granddaughter to be first row at the défilé, like a tribute to fashion heritage. Fashion creators need to rethink their models of development. Fashion labels have a strong, yet short-term desirability. It is something that can bring a lot of creativity and dynamism. Yet, we need to build the future of a business and a creative industry. As we know, people do not buy products anymore. They buy brands and experiences. For that, they need to feel deeply connected to the brands they interact with. This connection is a pure emotional and aspirational one. The only way to build this is for brands to capitalize on their strength in order to propose something unique, original, modern and creative. The basis of that? Heritage, know-how and courage. When Louis Vuitton shows all the tannery craftsmanship in their ateliers, or Cartier celebrates its métiers d’art, we are talking here about pure heritage. Yet, it is modern and give you a deep understanding on the brands and products you would buy. Alexander McQueen was gone at the top of his art, John Galliano just got crazy while driving the media machine that was Dior Couture and Prêt-à-porter at that time. Stefano Pilati had already left Yves Saint Laurent to join the Ermenegildo Zegna group and now he is leaving his position again. Raf Simons and Albert Albaz both declared that basically they felt like being lemons that you press the juice to the very last drop. The pressure of 4 to 6 collections per year, the PR pressure and the growing challenges of industry seeking rentability is pathetic. How can you create an original and innovative fashion item without the correct amount of time. Most of the time you have basically weeks to create and build the next big thing. There is a re-organization of things. Brands with a lead by global luxury groups are reorganizing themselves in order to maintain the required desirability levels. Small brands are finding their way thanks to fashion blogs, to proximity and buzz. What we do not know yet is what is going to happen with the Slimane, Elbaz and other Pilati? Will they build their brands independently from the groups they resigned from? Is it possible for a fashion brand to be independent? Probably the end of the year will bring us more insights. Info sourced in the different brands communication releases, Forbes, Fortune, Euromonitor and Wikipedia. All content is copyrighted with no reproduction rights available. Images are for illustration purposes only.